Tired of struggling with cords and cables when charging your devices? We've got a solution to help you! What if we told you that you could charge ALL OF YOUR DEVICES AT ONCE? So, having too many cables and cords around your office or home creates a lot of unsightly clutter. We've designed a device that helps you store and organize multiple electronics at one time! Plus, our charging station looks like a cute, but stylish mushroom AND it lights up! You'll love how this device is a central hub for your USB charging electronics. It encourages your work station to stay neat and organized. ****Our uniquely designed ****device is crafted from ABS and PC flame resistant material. 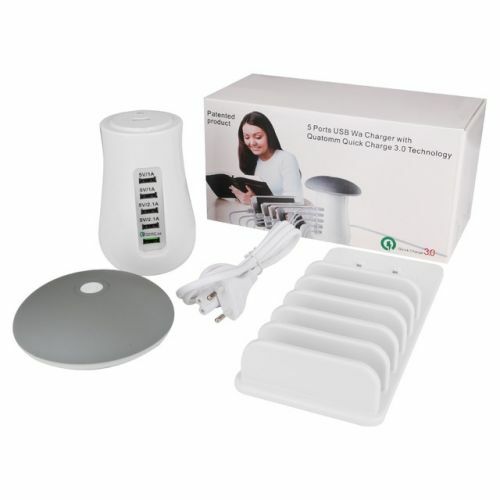 It is equipped with 5 convenient USB charging ports. You can charge 5 of your electronics at once! There is 1 Qualcomm Quick Charge 3.0 technology USB Charging Port which can be used in emergency situations. Feel free to adjust the amount of space the mushroom lamp takes up by removing the baffles, if you prefer. This little gadget is completely adjustable! And get this....IT LIGHTS UP! This device is perfect for the office, kitchen, living room, and more. It makes any space look great as well as acting as a functional lamp and charging port. Amazing!